Gorgeous poppies in a garden setting. The poppies are machine embroidered on a vilene base before being added to the whole cloth background. You can use a blanket stitch, satin stitch, or free machining to attach the flowers and leaves to the background. Beads can then be added to the centres of the flowers, adding a special touch to the quilt especially when shown in a lighted room. The sawtooth border is appliqued, not pieced, to the border strips. If you wish, you can have fun embellishing your border with beading and metallic threads. This two day workshop is at Epping Creative Centre on Sunday and Monday 17 and 18 June 2007. It is suitable for all levels. Some experience with free machine stitching, while not essential, would be helpful. Workshops are available only to current financial members of the Guild and you must complete and lodge a workshop booking form. Template 25/2 - almost here! As part of the process of bringing The Template to you, the printers send colour proofs of the magazine to be approved by the Template Editor (that would be me!). Volunteer proof readers have reviewed the edition before the printers see it (I always hope there won't be too much for them to catch). The colour proofs, as you can see from the picture, have four pages to each (large) sheet, and are of course printed as is logical for the printing process - so it's lots of fun hunting out page by page to check them (now on which sheet did I see that page?). That was this afternoon's work, so the printers can go ahead tomorrow. The cover of 25/2 is the raffle quilt, this year a wonderful medallion from the St Ives Quilters (you'll receive raffle tickets with your issue). The other double page spread you can see is more of the "Going to Pieces" challenge quilts (can you see yours there?). We're hoping to get the magazines posted to you very soon. In this class Lisa Walton will teach a selection of bead embellishment techniques and stitches to start creating a small sampler which can grow to become a wonderful tactile masterpiece. No sewing machines are required. You will be learning to use a selection of beads, sequins and cabachons. Workshop notes will be supplied and Lisa can provide a kit ($20) which will contain all the beads, threads and needles required for your class. Only a few additional items including fabric will be required. Lisa will bring a selection of reference books and quilts to inspire you. 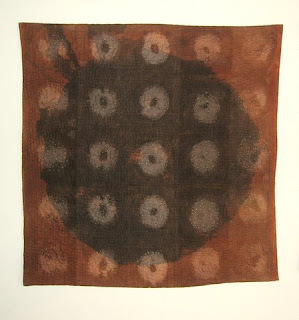 An initiative of The Australian Forum for Textile Arts, this exhibition evolved from a master class in 2002 by Korean textile artist, Chunghie Lee, for Australian textile artists. Lee shared the processes and ethos of the making of the Chogakpo pojagi, traditional patchwork Korean wrapping cloths. Presenting works by Lee and her students, Pojagi and beyond translates a Korean tradition into a contemporary Australian context. Goulburn Regional Art Gallery until Saturday, 17 March. Aspects of landscape have long informed the work of contemporary quilt artists Judy Hooworth and Pamela Fitzsimons. Changing Places investigates in intimate detail, the artists’ understanding and responses to their ‘place’ within their (new) landscape, through a collection of inspiring fibre works. 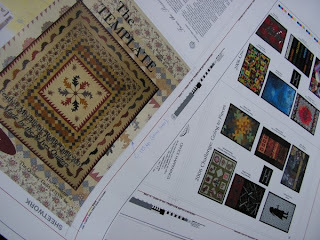 The deadline for submission of entries for Sydney Quilt Show 2007 was Thursday, 1 March 2007. While we have received and processed a handful of late entries, no further entries will be accepted. If your entry form is still sitting on your sewing table, it really is too late! I can promise you that there will be many wonderful quilts for you to enjoy at Darling Harbour this year. Approximately 370 entries have come into the Guild office and the next challenge for the Quilt Show sub-committee will be to work out whether and how we can display all of the quilts in the exhibition space available. As noted in the conditions of entry, a member may submit up to two entries but only one may be selected. Acceptance letters will be sent out to entrants at the beginning of May together with contact details for your "Drop Off Lady" who will help deliver your quilt for judging. Acceptance of entry doesn't automatically guarantee display but we will be making every effort to ensure that as many member quilts as possible are included in the Guild's 25th Anniversary exhibition. This means we will need a full contingent of white glove personnel and people to sell catalogues. While entries may have closed for the Quilt Show, it is never too late for members to volunteer - complete and send in your volunteer form now! Congratulations to Guild members Belinda Betts and Ann Visman from Orange who have each had quilts accepted as semi-finalists for further judging at the 2007 AQS Show in Paducah, Kentucky in April. Definitely Floored by Ann Visman was also machine quilted by Belinda. The design was inspired by a photo of a parquetry floor, and Ann's exquisite designing and patching skills have resulted in this beauty. It has radiating lines, feathers and heavy background fillers as the quilting designs. Ann is a Guild-accredited patchwork teacher and is available for teaching anywhere in Australia. You can e-mail Ann for further information.